Anyone that has sat through one of my presentations has likely heard me recall the ‘experiment’ of the five monkeys in a cage. As the story goes, a group of scientists place five monkeys into a caged enclosure. In the middle of the cage, there is a ladder; and, directly above the ladder, hanging from the ceiling, there is a banana. 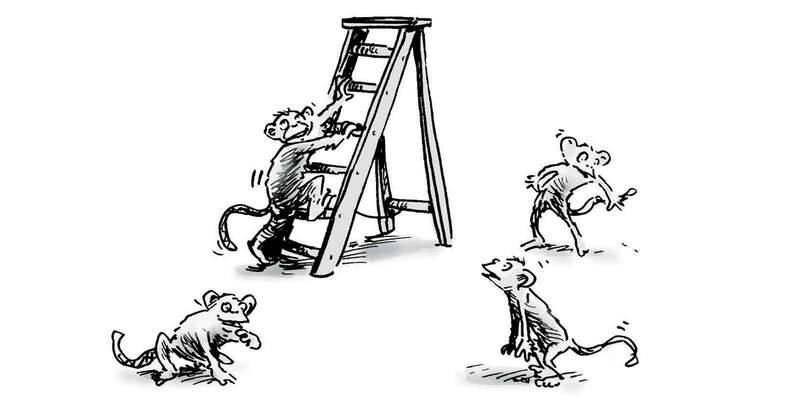 The first monkey walks around, looks up, sees the banana, and starts climbing the ladder. Right before it reaches the top, a scientist sprays the monkey with ice water. Now, monkeys hate water — let alone ice water — so the monkey shakes it off, jumps down, and goes to sit in the corner. A second monkey paces around, looks up, sees the banana, and starts climbing the ladder. That monkey is also sprayed with water, comes back down, and sits in the corner. This is repeated until all five monkeys have been sprayed with ice water — the banana still dangling from the ceiling. One of the monkeys is then removed from the cage, and a new one is introduced. That new monkey looks up, sees the banana, and starts climbing. The monkeys that were just sprayed with water pull that new monkey down and beat the living snot out of it. Another of the original monkeys is then removed and a new one is introduced. That monkey looks up, sees the banana, and starts climbing the ladder. The very monkey that was just beaten pulls the new monkey to the floor and pummels it. This recurs until all five of the original monkeys are removed from the cage, one-by-one. Yet, every time a new monkey is introduced, the remaining primates — which have never been sprayed with water — pull that monkey to the ground and give it a wallop. There’s no reason why any of those monkeys could not go up and get the banana; in fact, the water has long since been shut off. So what does that tell us? It tells us that cultures are products of behaviours. In other words: Reality is often four-fifths perception. If you say the sky is falling long enough, eventually, the worst will land square atop your head. While this story is more of a modern-day fable than experiment (it is actually based on the real-life behavioural research of G.R. Stephenson and Wolfgang Kohler), the premise has many parallels to the business climate on the Prairies today. For many manufacturers, yes, the last 18-24 months have been lean. But the sky is not falling, and there is reason to remain positive. Between 2000 and 2015 (and despite a marked drop-off from the peaks of 2013 and 2014), manufacturing in Alberta, Saskatchewan, and Manitoba ballooned 58 per cent to nearly $100 billion in cumulative sales — outpacing the national average of 8.6 per cent by a ratio of close to 7:1. And we’ve reached that plateau with approximately the same size labour force — a testament to our productivity, ingenuity, and hard-nosed grit. With that in-mind, I don’t walk around with rose-coloured glasses, either. Half of my own family works in and depends on the oil sector, and I’ve seen first-hand the impact softened commodity prices have had. But, as Jayson Myers, president and CEO of Canadian Manufacturers & Exporters, notes in his column later this issue (Page 12), this is not the time to look upward — it is the time to look ahead. It is the time to double down on investing in efficiencies and innovation. Refining processes, exploring new markets, and delving headfirst into developing next-generation products are near-impossible when you’re running at 120 per cent capacity. It is the time to right-size with the right people. No one likes to see folks lose their jobs; however, businesses that are ‘fat’ with under-qualified workers in overpaid roles do not compete for long on the global stage. And it is time to train. World-class manufacturing hinges on a world-class workforce. Compounded with incentives such as the Canada Job Grant, there is a unique opportunity at-hand to build vital competencies while keeping your key staff engaged. The Prairies have always been known as a place that makes the best out of a tough situation. The rest of the world will not wait, so it is up to us to plough ahead. Stay focused and be optimistic — it is quickly becoming a business and economic differentiator.